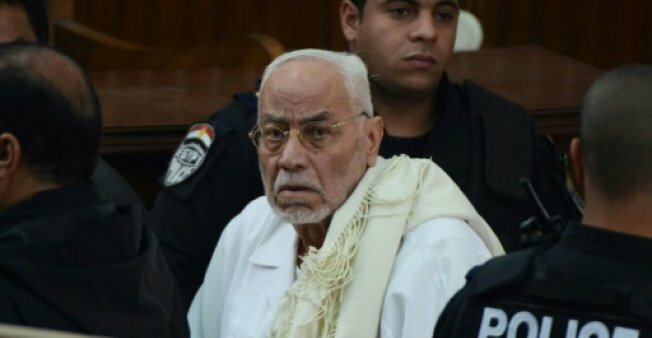 Egypt's former Muslim Brotherhood supreme guide Mohammed Mahdi Akef who died September 22 is seen here in a Cairo court on 28 February, 2015. CAIRO - Former Muslim Brotherhood head Mohammed Mahdi Akef, who helped turn Egypt's Islamist movement into a major opposition force, died on Friday in a Cairo hospital aged 89, his daughter said. Aliya Mahdi Akef made the announcement on Facebook, saying "my father is in the care of Allah (God)". Ten months before his death, Akef had been transferred from jail to the hospital in Cairo for cancer treatment, Brotherhood lawyer Abdel Moneim Abdel Maqsud told AFP. He had been arrested and jailed in 2013 after the military overthrew Islamist president Mohamed Morsi and jailed his supporters and fellow Brotherhood members. Akef, who was born in 1928, headed the Brotherhood from 2004 until 2010. The lawyer said Akef would be buried later Friday. Under his leadership, the Brotherhood won 20 percent of parliamentary seats in 2005 legislative elections, a historic achievement for the then banned but tolerated movement. The group emerged as the most organised opposition force against president Hosni Mubarak's regime, campaigning against police brutality, corruption and rampant inequality. Mubarak was overthrown in 2011 after an 18-day uprising. Akef spent more than 26 years of his life in jail, the first time after a failed assassination bid against pan-Arabist leader and former Egyptian president Gamal Abdel Nasser in 1954. After Morsi's ouster he was sentenced to life in prison, meaning 25 years of detention, for his alleged role in the deaths of 12 anti-Brotherhood protesters who tried to attack the Brotherhood's Cairo headquarters in June 2013. The Court of Cassation overturned that verdict and ordered a new trial, but leaving him behind bars again. Former Muslim Brotherhood head Mohammed Mahdi Akef, who helped turn Egypt's Islamist movement into a major opposition force, died on Friday in a Cairo hospital aged 89, his daughter said.